Bill O'Leary, photographe pour H2ACDC.COM. Souvenirs brûlants de New York 80. 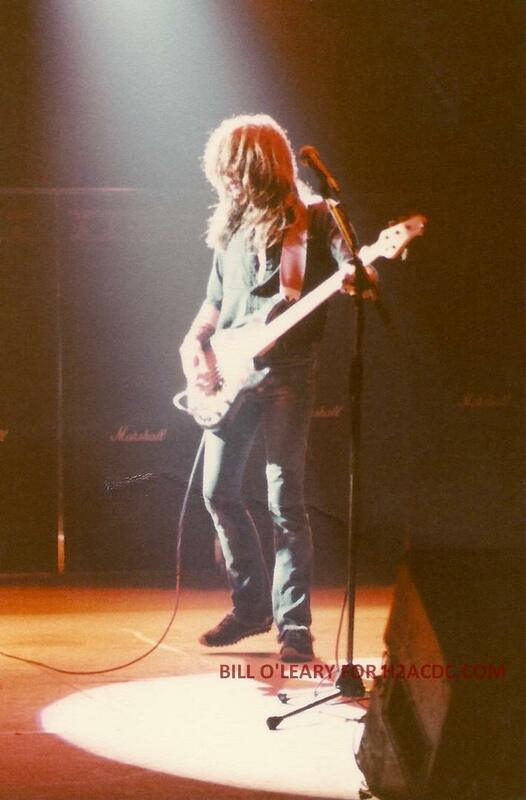 I started taking concert photo's in 1977 at an ANGEL (1) concert. 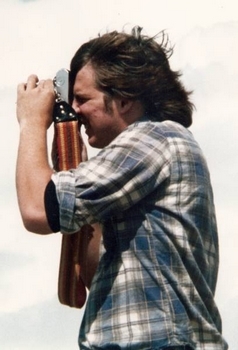 I had a cheap camera called an Instamatic. Shortly thereafter, I realized that I needed to leave each concert with more than a ticket stub, a t-shirt and maybe a Tour Programme. I quickly got very good capturing the action and realized that good seats upfront really helped of course. Firstly, the lighting is constantly changing and generally much darker in an arena, than say outside. I always prefered "not" shooting with a flash, as the photo's seemed "fake" and not what your own eye would see. 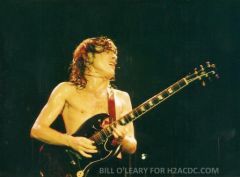 Secondly, there is very fast movement, especially with a guitarist such as Angus Young. You have to know when to shoot the shot at the perfect moment. I would say it is much more challenging, especially if you are shooting from within the crowd where things can be very chaotic and aggressive. When did you first discover AC/DC ? Was it like love at first sight/hear ? 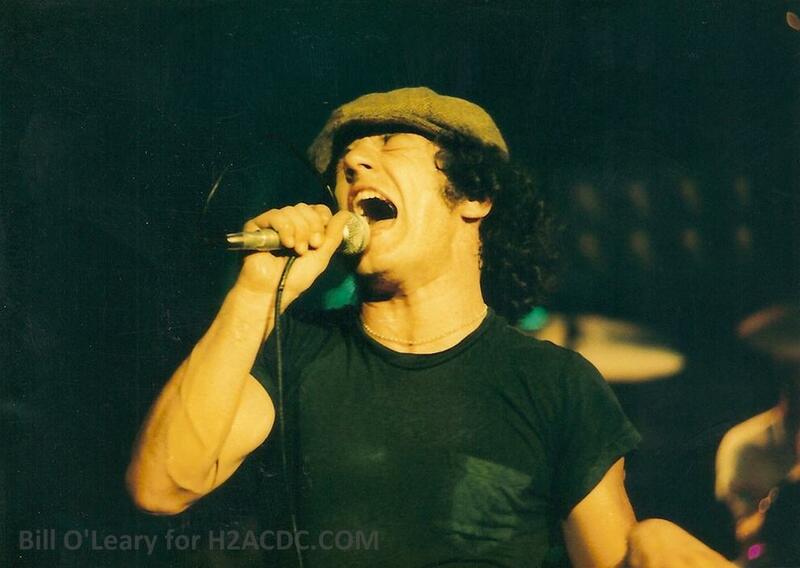 I first heard the album "Let There Be Rock" in the summer of 1977 at a beer keg party. Loved how agressive it sounded as well as Bon's unique style of vocals. It reminded me of The Sensational Alex Harvey Band sound alot. 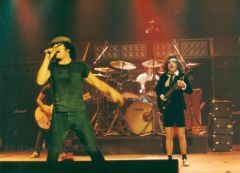 What does AC/DC represent for you as a photographer ? 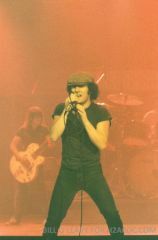 AC/DC is a very big headlining band worldwide, they have a very large fan base and I have sold many photo's to these fans over the last 30 plus years. 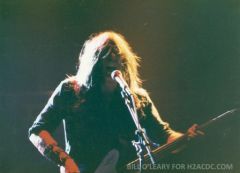 My photo's of the "Back In Black" Tour are some of my best work in my opinion. I captured the raw energy on this night (see photos on this website). 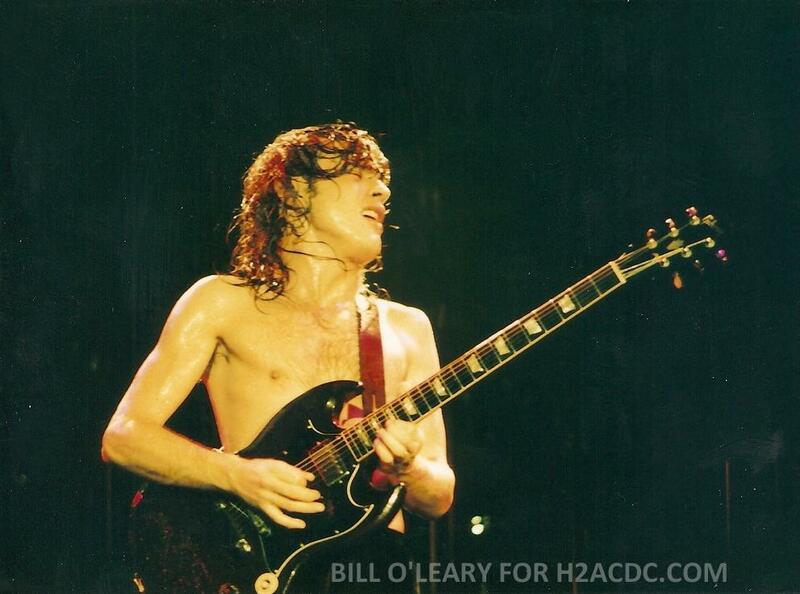 I only shot AC/DC on the "Back in Black" Tour on Friday, August 1st., 1980 in New York City at a venue called The Palladium at the time. Wow, what a night. First of all it was one of the hottest days on record that summer, temps were well into the 100F to 110F degrees with 90% humidity, there were electric outages all over due to the demands put on the system by air conditioners. In fact the air conditioning system had broken down in the Palladium prior to showtime, it had to be 120F degrees inside. I brought a girl I was dating to the show, we got to our seats in the 3rd. row, center. 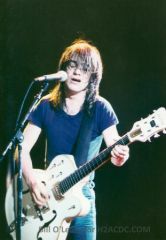 Def Leppard did a quick 40 minute set as the opening band, they were good and very young at that time. 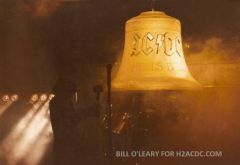 Then after a short break the house lights went dark and I remember alot of stage smoke blowing on stage, then a very loud bell started to toll and it was if to signal the start of total mayhem and chaos as the crowd overheated and uncomfortable went crazy. I stood on my seat and started taking pictures right away, I had a great angle and clear view as if I was in the front row. 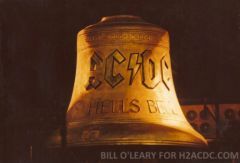 During the first song "Hells Bells" some crazed idiot started to grab my arms and camera bag as if to pull me off my chair, so I had no choice but to clock him right on top of the head with my "spiked wrist gauntlets" that I wore to "metal" shows back then, needless to say he went down to the floor and crawled away. I focused on taking pictures again, shooting very fast along with the energy coming off of the stage. I remember looking around at the audience at that point and seeing people passing out left and right, fighting all around with eachother. Next thing I know, my girlfriend who was right next to me, passed out from the heat, and security drug her outside along with all of the other's who could not handle the heat. I knew she would be safe, with security so I continued to shoot photo's as fast as I could, not knowing how long I would make it in the mayhem. 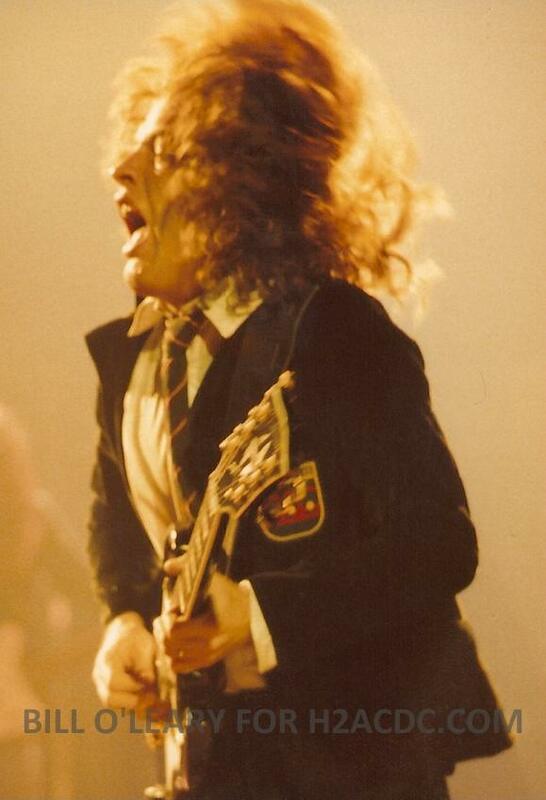 About 4-5 songs in to the show I noticed Angus Young getting very irritated with someone in the front row right in front of him. 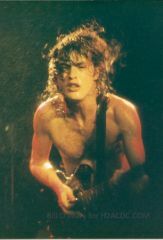 It appeared that they kept grabbing his socks and pulling on them, unbelievably, he was in no mood due to the heat, so he literally threw his guitar down on the stage right in the middle of a song and dove into the crowd headfirst with fist's and elbows flying, two roadies dove in right behind him, the band looking on in amazement kept on playing not missing a single note. Angus, jumped back up onstage and grabbed his guitar and went nuts playing as if nothing happened. At this point, after only shooting about 6 songs of the show, I had to leave to check on my date, who I found outside seated on the sidewalk, up against the wall with about 50 others being hand fanned by security guards to cool them of and bring them back. Again, wow, talk about intensity. There's always something special out of the AC/DC pictures. Power, energy, rage. How would you explain that ? How did you capture this energy ? It was just so intense that I knew I had to get as many photo's as I could. And under that kind of pressure, I was so happy to later see that those shots were some of the best I had ever taken. 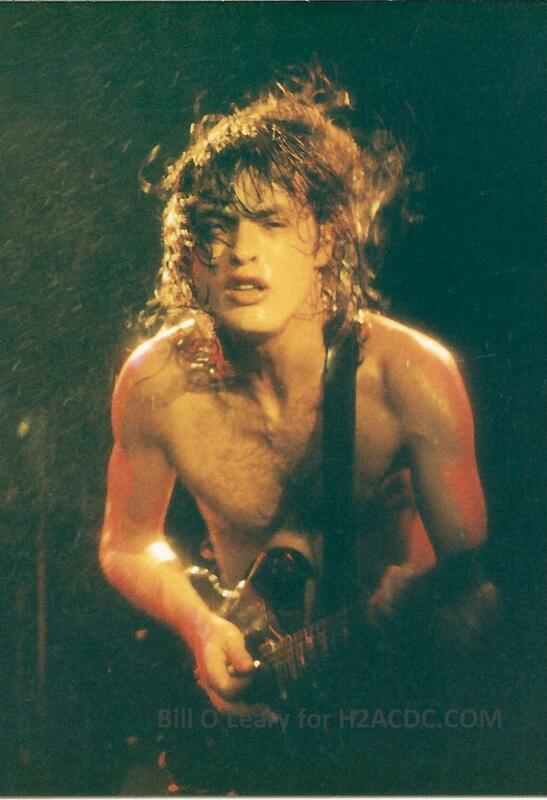 I mean to capture Angus with sweat flying looking right into the camera, I could not have wished for a better photographic outcome. I will never forget that show. Well, they are still going right? They have never altered who or what they are, especially musically, just in your face rock n' roll. I very much respect them and their career. 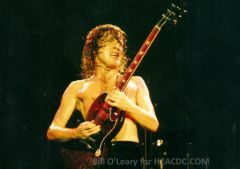 My fave albums are "Powerage" and "Highway To Hell" I love the Bon Scott era, all do respect to Brian for filling those shoes.it certainly turned out to be the right choice...I did not think anyone could do the job, I was wrong. Which word would define best what AC/DC is in the rock history ? 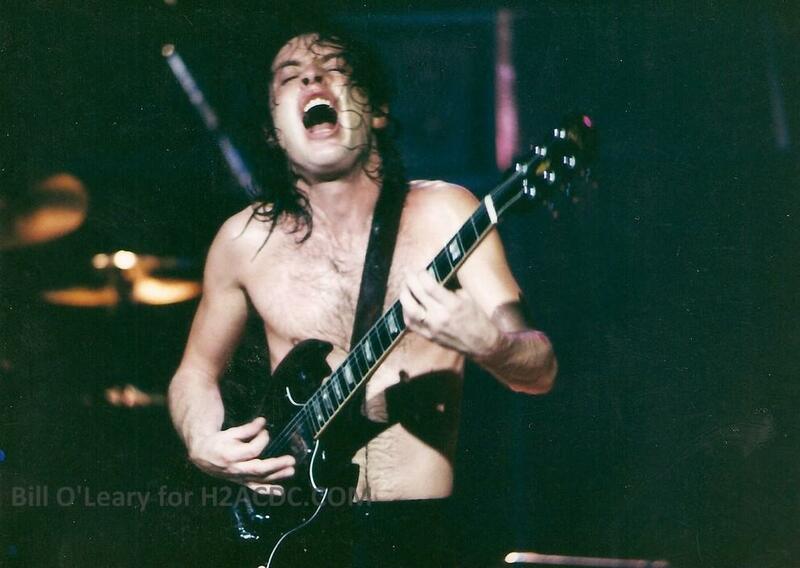 The 1980 show certainly is at the top of the list, out of some 400-500 shows. Just keeping my website up to date : www.timelessconcertimages.com. Also, contributing my photo's from the Rockshots Photography archives to magazines, documentaries and dvd's, etc. 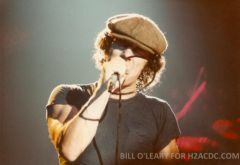 I can also be contacted directly at rockshotsphoto@comcast.net with any inquiry's. Do you have a message for http://www.highwaytoacdc.com/ and its members ? 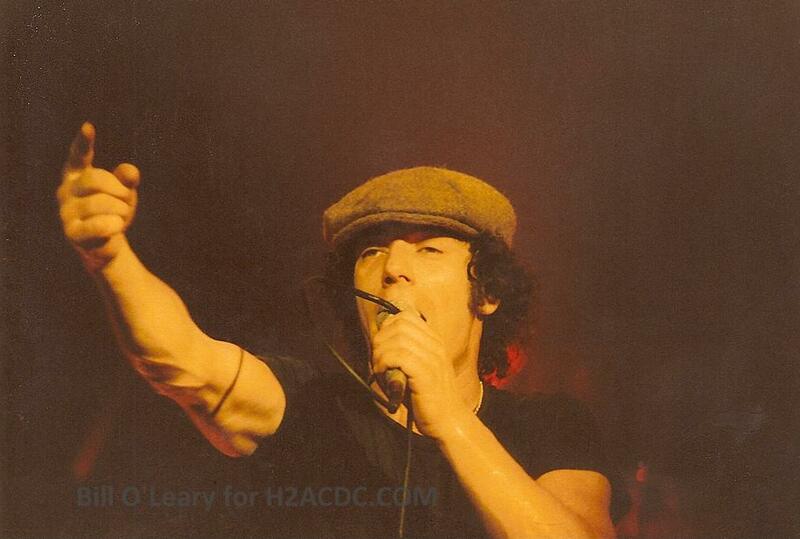 Keep supporting the band, directly, when possible. They have paid their rock n' roll dues. 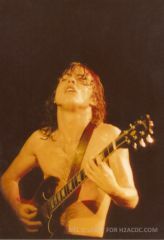 I hope you enjoy my photos of AC/DC, that night was one of a kind. Thanks. (1) Glam rock band from Washington discovered by Gene Simmons.